William Claassen is a longtime social activist, writer, traveler, and photographer. He now lives at Pendle Hill, the Quaker center for spiritual growth, study, and service in Pennsylvania. His website is www.williamclaassen.com. An affectionate, insightful look into monastic life. Here is the opportunity for anyone to tag along with William Claassen to experience the quiet miracles happening in monasteries today. 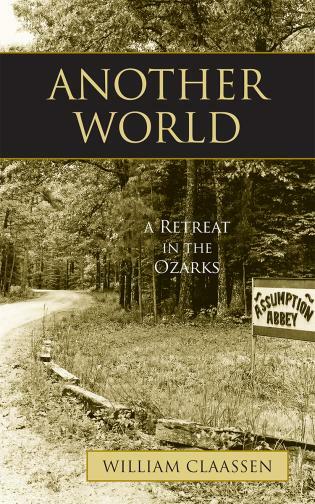 In an age when everyone is discovering the monk within, it is refreshing to read William Claassen's Another World: A Retreat in the Ozarks. Claassen, a lay visitor and retreatant, writes with great empathy and insight as he relates his monastic adventure. It deserves a wide readership. A welcome addition to the burgeoning literature by lay people who make a strong and loving case for the continuing pertinence of the monastic life for contemporary seekers. This is a well-researched, finely observed, and sympathetically written volume. William Claassen's reflections show that monasticism has a radical signpost for all of us to live in greater concordance with one another and with the world around us. [Another World] brings together Claassen's many and diverse experiences both inside and outside various monastery walls. In the context of his own retreat, the author skillfully mingles details from his life with those of the monks and monastery visitors he meets during his stay, adding flashbacks to his past and sketches of his dreams. . . . Claassen's blended religious background and perspective make this an inviting book for readers of any or no faith, and his photographs provide added visual interest. [Claassen] weaves his own musings with those of the monks and fellow visitors while observing the time-honored rhythms of the community. Reading this book feels a bit like a retreat unto itself. Claassen believes the monks have much to teach our society. . . . More people visit monasteries than call them home. Claassen's book shows why such visits can offer spiritual refreshment. As Claassen describes his walks around the winter grounds—often blanketed in snow—a reader can sense how his own spirituality seems wrapped in a down of comfort and protection. 'Each retreat day I peel back yet another layer of conciousness and, in doing so, reach a deeper level of awareness and vulnerability. Claassen writes in such a way that it places you there while experiencing everything in the monastery. . . . Author William Claassen is an appealing writer for religion and spirituality book enthusiasts as well as travelers who enjoy finding destinations off the beaten path. . . . Another World is just that—a spiritual journey into a completely different plane of existence. Classen was given the talent to describe this lifetime process of bridging both worlds, acting for social justice causes on the outside, and being renewed spiritually and psychologically on the inside. Even his musical references are bilateral. . . . All these mental meanderings have culminated in the birth of this small, to-be-treasured volume, including selected quotes from many titles in its refined bibliography. In total, they represent Classen's six-decade milestone, a gift to his readers and himself. Readers . . . will appreciate finding this volume on library shelves. His thoughtful prose shows both monk and visitor in deep reflection, using time apart from the world as a means to understand it better. Another World is, among the countless books published this year, a stand out volume, a wonderful book that deserves countless readers. Another Wolrd takes the reader behind the scenes of Assumption Abbey, a secluded Trappist monastary in the foothills of the Missouri Ozarks, where 14 monks live in prayerful community and bake fruitcakes to support themselves. . . . He (Claassen) participates in the daily schedule of prayer and worship and gradually finds himself quieting down. As new visitors arrive, he detects a difference between his newfound peace and their city tension....The book is written without advocacy for this way of life, but the reader comes to understand its appeal. For years, discussions of faith have been dominated by right-wing Christians. But William Claassen's Another World shows two alternative Christian faith traditions—one of contemplation and thoughtful community engagement; one of liberation theology and commitment to freedom from opression and hate. Another World explores day to day life in a small Trappist monastery tucked away in the Ozark foothills. Interweaving memoir with conversations with the monks, observations of community life, and relationships with other visitors, Claassen provides a window into contemporary monastic life. Each chapter describes a day in the monastery. The reading experience is like spending time away from the world in a real community that is very human and gently inspiring. Eighteen black & white photos by the author further evoke the experience.